Eighteen kilometers from Autun, not far from our charming bed and breakfast in Burgundy, stands the castle of Sully-Saint-Léger. One of the most magnificent of Burgundy. Bussy-Rabutin was filled with admiration when he penetrated there for the first time. Especially at the sight of its monumental court. « the most beautiful court of France, » he wrote to his cousin Madame de Sévigné. The present building, whose construction began in 1570, rises on the site of a primitive castle, of which only a tower with its gate remains. This tower was built in the 13th century. Sully-Saint-Léger was only completed in the first years of the seventeenth century. It underwent as well in its order as in its decoration the influence of the castle of Ancy-le-Franc. The church inside the buildings was transformed into a chapel dates partly from the twelfth century and partly from the thirteenth century. 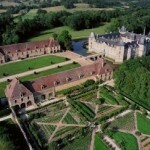 The castle of Sully-Saint-Leger is divided into four main buildings enclosing a square courtyard. At each corner of these building blocks stands a square tower. The bridge which once defended the entrance of the castle was suppressed. From the primitive ditches there remains only one. The large square courtyard, which is such a magnificent architectural ensemble, dates back to the second half of the 16th century. The pavilion which faces the valley seems to date from the reign of Louis XIV. Inside the castle, there are three beautiful tapestries from the Gobelins workshop dating from 1724. This magnificent castle saw the birth of President MacMahon. It is to this day the property of the Duchess of Magenta. Do not hesitate to contact our charming bed and breakfast in Burgundy for your accommodation during your stay in the region.